Li Shufu, founder and controlling shareholder of Geely Automobile Holdings Ltd., is buying another problem asset for his collection. Chinese automaker Geely will be taking a 49.9 percent stake in Malaysia's iconic, home-grown, but long-struggling carmaker Proton. This is in view that Geely has a proven track record of rescuing renowned Swedish automaker Volvo, which it bought in 2010, and sales of the Swedish brand exceeded the half a million mark within five years. Geely, including its Volvo brand, ranked just 16th globally on World Car Group's ranking by sales in 2017. Geely's founder Li Shufu, sometimes referred to as the "Henry Ford of China," is a self-made entrepreneur who started building cars in 1998. Geely chalked up car sales of 1.3 million units in February last year. As investor, how can we benefit from Geely? Many retail investors know that they can buy Hong Kong stock but most of them choose Not to learn and would rather said "Not Familiar" & "Don't Know How". Is this sound familiar to you? Since early 2016 until recently, Geely stock price (0175.HK) has been appreciating more than 300% in less than 1.5 years (see above chart). 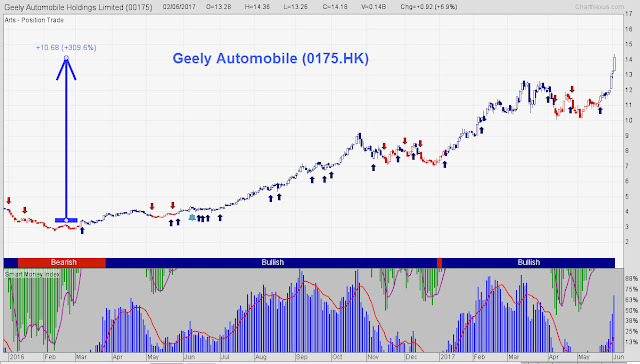 Read our previous post on Nov 2016 when Geely price was only HKD8.00, as of last Friday, high price was HKD14.36, this represent 77% gain. Congrats those who follow our post. Remember, opportunity will not come to you unless you take action Now to learn New Skills! How to find Hong Kong and China Stocks that got potential to run up more than 300%?